I took no pleasure in reading this book, nor do I take any in cataloguing its flaws. The title itself with its initial, indecisive participle hamstrings progress toward coherence . . . . The publication history page, with its reference to the “british Library” damages the credibility before we even reach page i . . .
. . . . Who is to blame for what constitutes the most poorly written work of published “scholarship” I have ever read? . . .
. . . . Unfortunately, I cannot recommend this book to anyone. Neither its ideas nor its writing meet any standard I recognize for publishable biblical scholarship. Nowhere does Michelson acknowledge that it served monarchic interests writing “after” to exaggerate the evils of the time “before,” in the same way that weightloss advertisements contrast images of slouching corpulence with svelte elegance. It's interesting to ask how far it is worthwhile to write a really, really negative book review. My general policy has been to turn down the invitation to write reviews of books that I think very bad. I tend to think that there comes a point where it is better for a book not to be reviewed at all than for it to be reviewed really negatively. I suppose I worry too much about what the author's mum might think if she were to see the negative review. Perhaps negative reviews do have a part to play, though, in alerting publishers to material that has made it through their processes, or to alerting doctoral dissertation committees of radically dissenting opinions about the worth of the project. Professor of New Testament Literature and Exegesis Emeritus. Professor Meyer, who died at the age of 89 on Monday, July 29, in Chapel Hill, North Carolina, is survived by his wife, Mary Lou, and by two daughters, Katherine and Elizabeth. The son of missionaries to India, Professor Meyer earned his Th.D. from Union Theological Seminary, New York, before beginning a teaching career at Yale University Divinity School as Assistant Professor of New Testament. At Yale, he began a lifelong friendship with J. Louis Martyn and was a teacher of both Wayne Meeks and Moody Smith. 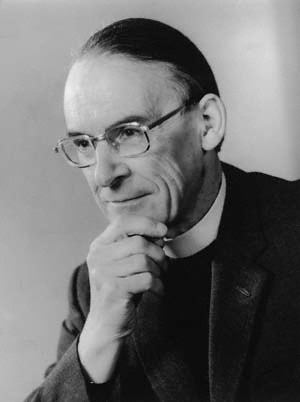 He subsequently became Professor of New Testament Interpretation at Colgate Rochester Divinity School (1964-1970), before joining the faculty of Vanderbilt (1970-1978), followed by Princeton Theological Seminary where he served until his retirement in 1989. He was the Shaffer Lecturer at Yale in 1976. His collected essays, and his masterful, succinct commentary on Paul’s Letter to the Romans, were published in 2004 under the title, The Word in this World, edited by John T. Carroll . . .
You can read more at the link above. 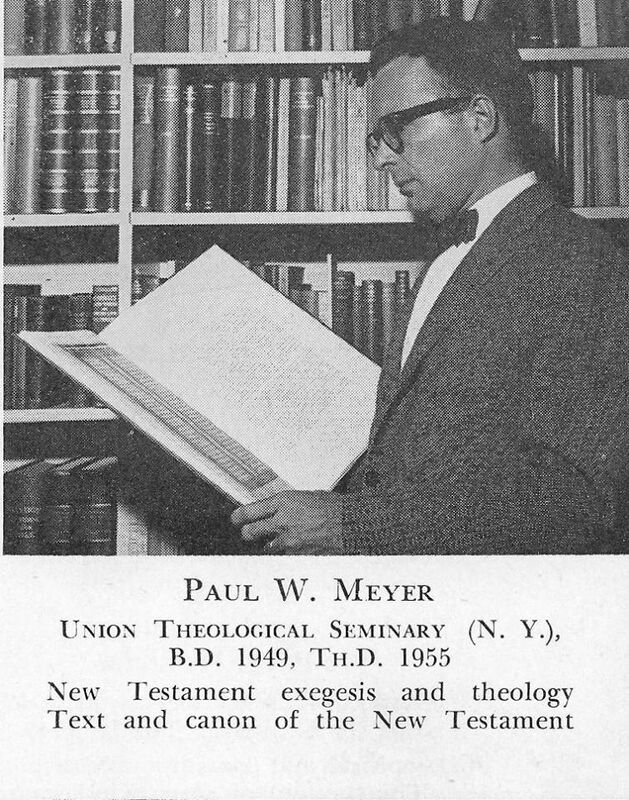 Paul Meyer was a fine scholar and also a true gentleman. I was lucky enough to get to know him in recent years since he lived in North Carolina and was a regular at Joel Marcus's New Testament and Jewish Studies colloquium at Duke. I hear from his students that he had a knowledge of the literature that was unsurpassed, but at the same time he was a gracious and insightful teacher. He will be greatly missed. Update (11.55pm): Many thanks to Matthew Montonini for sending over the picture above. 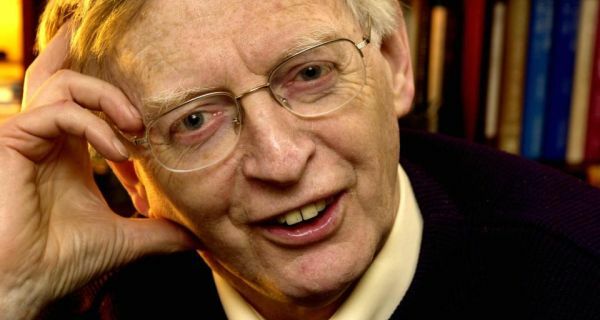 One of Ireland’s best-loved and most respected theologians, Seán Freyne, has died in Dublin. Director of the Centre for Mediterranean and Near Eastern Studies, Dublin, he was professor of theology (emeritus) in the school of religions and theology at Trinity College. His academic interests included a study of Galilee in the Hellenistic and Roman periods, the historical Jesus, the gospels, and aspects of early Jewish and early Christian history. He published several books, most recently Jesus a Jewish Galilean: A New Reading of the Jesus Story . . . .
Freyne was a fine scholar who made a major contribution to the study of the historical Jesus, and especially Jesus' Galilean context. He was also a kind, witty and delightful human being. In a world where many academics think that pomposity is a virtue, Freyne was simply a pleasure to be with. He let his erudition emerge in the process of engaging in an open and lively way with his audience, not in instruction or dogmatism. I heard him lecture several times and it was always a pleasure. I met him for the first time in August 1996, at the SNTS in Strasbourg. As a young scholar at my first international conference, I often felt lonely and ill at ease, but Seán was one of the handful of senior scholars present who was kind and friendly. I was on the same corridor as him in a rather steggy hall of residence, but he invited me to participate at his late night whisky gathering on condition that I brought my own glass. All I could find was the lid of my deodorant bottle and I don't think whisky has ever tasted so bad, but it did not matter given that he made me feel welcome. Raymond E. Brown, S. S.
It features pictures, video-clips and several full PDFs of Brown's articles. Strongly recommended. With the announcement of the twelfth doctor's casting still fresh in our minds, it's perhaps time for blog post about Doctor Who. I've long thought that the way that Doctor Who fans talk about "canon" is rather different from the way that we might talk about the "canon" of the New Testament and, given that the term "canon" in fandom is derived from "canon" in early Christianity, I have sometimes thought about how the two discussions might inform one another. It was great fun to have this discussion, and I'm grateful to Chip for the invitation. Jeffrey Gibson recently made available a whole bunch of audio recordings of George Caird's lectures. I uploaded these to my webspace, and Matthew Montonini indexed them (See George Caird's New Testament Theology Lectures Online). Matthew also blogs on this here. Academic Blogging: What are the benefits? I suppose one could ask about the benefits to the blogger and the benefits to the reader. It's easier to talk about the benefits to the blogger. Academics are a big-headed bunch and blogging gives them a nice outlet for their desire for self-publicity. And the nice thing about academic blogs is that not many people read them, so the academics can get on their soapbox and go and sound off to a handful of readers and get that out of their system, hopefully honing their purer and better thoughts for proper publications like books and articles. I sometimes wonder whether one should think of publication as being on a continuum, from tweets to blogs to critical notes to articles to introductory books to monographs. The summit of all publication is the monograph, and the well-written monograph actually takes some real skill and effort. Tweets, on the other hand, at the other end of the spectrum, are forgotten almost as soon as they are uttered. Blogs are somewhere in between. They take a bit more effort than a tweet but like them they are pretty ephemeral. It's remarkable just how quickly we forget them, and that's if we ever read them in the first place. When it comes to the benefits to the reader, I think there is one major benefit and here, again, I have to point to Jim Davila's Paleojudaica as a fine example of the genre. The blogs have genuinely had some success in holding the media to account. Extravagant claims in the media have often been successfully challenged in the blogs. Here the collaborative, "horizontal" nature of some of the best blogs has made a key contribution because where many eyes look at the same data, they are more likely to notice key elements. Further, the range of different expertises in the different blogs also plays its part. I'd like to think also that the blogs have helped those who read them to be a bit better informed about developments in our area. I know that when I talk to the (vast majority of) colleagues who never read the blogs, I am often surprised about news items they have missed. If you read the blogs, you do get to hear about interesting discoveries, new TV and radio programmes, sad deaths in the area, conference announcements, new books, new journals, new journal entries and so on. So while we might poke fun at the bloggers, and laugh at their self-indulgence, in fact they have proved their worth in recent years by keeping us all informed and engaged, and sometimes, if all too rarely, entertained and amused. Academic blogging: When and Why? "When" is easier than "why". If only it were this easy with dating the Gospels! For the Gospels, I'm inclined to think there that the "why" is easier than the "when". We know only roughly when the Gospels were written (sometime after 70, I argue), but it's fairly obvious why they were written (to tell the "good news" about Jesus Christ in narrative fashion to as many as far as possible). But yes, it's about ten years since I started blogging. I started blogging because I thought it would be fun. Jim Davila was already doing it on Paleojudaica and he was brilliant at it. He still is. Somehow, Jim just has an instinct for how to do it well, and to this day I don't think there is anyone who has such a natural, instinctive feel for medium as Jim has. Somehow, he is able to get exactly the right balance between between reporting the latest in the area and providing compelling, accurate and lucid comment, and without the sort of self-indulgence that is all to common elsewhere. Actually, since I've started on this, let me rant a little longer. What I like about Paleojudaica, and the reason that it is still the blog that provides the template, is that it understands what academic blogging is about. It is about critical engagement with what else is out there on the net pertaining to the area in question. Sometimes -- more often than not -- Jim can see that all that you need is a link and a description. Let the punters know what is out there -- quick link, quick description, quick bit of background,with links, if necessary. But sometimes, Jim knows that a bit more is needed. Because of the trust he gains by means of the sober, newsy items, he is able to add a little more comment when it is required. And he gains the reader's trust by giving us a whole list of background links. "For background, see here", etc. The reader is calmly assured that there is a history to to whatever the item is, and you will be able to follow it up in the blog. I sometimes wonder if one of the reasons for the continued strength of Paleojudaica is that he has resisted adding a facility for comments. I recently distinguished between what I call the "horizontal" blogs and the "vertical" blogs. Vertical bloggers thrive on the interaction with their own commenters and generally resist the "horizontal" interaction with fellow bloggers. Jim is the opposite. With no comments at all, he can interact with other blogs where necessary, and with the focus on the news, he can avoid the self-indulgence that is too easy for those whose blogs largely focus on their own ideas and enthusiasms. Moreover, he does pick up and engage with email commenters and my guess is that this too enhances the quality of the product. But yes, it was because of Paleojudaica that I began blogging. There was another major issue which was unique to me, however, which was that I was running a website called The New Testament Gateway that was giving me some grief. Long before I had heard about blogging, I used to have a "log book" on the site which I used to record every update to the site. I also used to have a "Featured Links" section. A decade ago, it occurred to me that I could combine the idea of blogging, following Jim, with some of the peripherals from my NT Gateway, like the log book and the featured links section. And this worked well for several years until I leased off the NT Gateway from the blog, and the NT Gateway blog became the NT Blog, as it is now. So that's all to say that my blog was never quite the same as the purer biblioblogs. It used to be an integral part of the NT Gateway, and you can see that if you look back through the archives, but now it is its own strange, malformed beast. One last thing. I love the fact that there are a million other blogs in the area and to a large extent, this has helped me to post less. In the early days of the biblioblogs, when it was just me, Jim Davila, Jim West, AKMA, Stephen Carlson, Rubén Gómez, Tim Buckley and co, there were few reporting and commenting on the key news stories. But now, you can guarantee that someone has got to it before you, and that enables you to be much more selective.